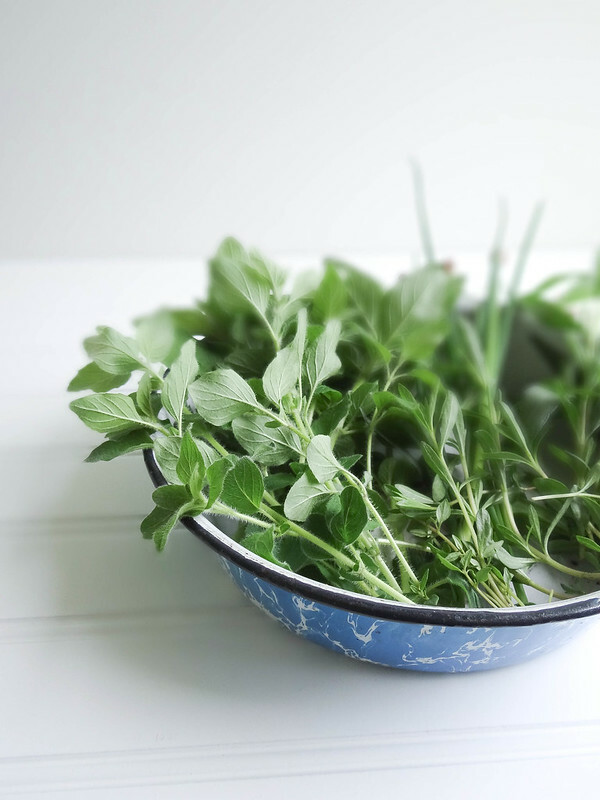 The Oregano comes back with a vengeance every year. Already shortly into the season it has gone crazy wild, vibrant green and abundant. As you can see, plays a major role in my version due to the quantity I currently have found myself with. Fresh, lovely and easy to make- really, it takes no time to make a batch. 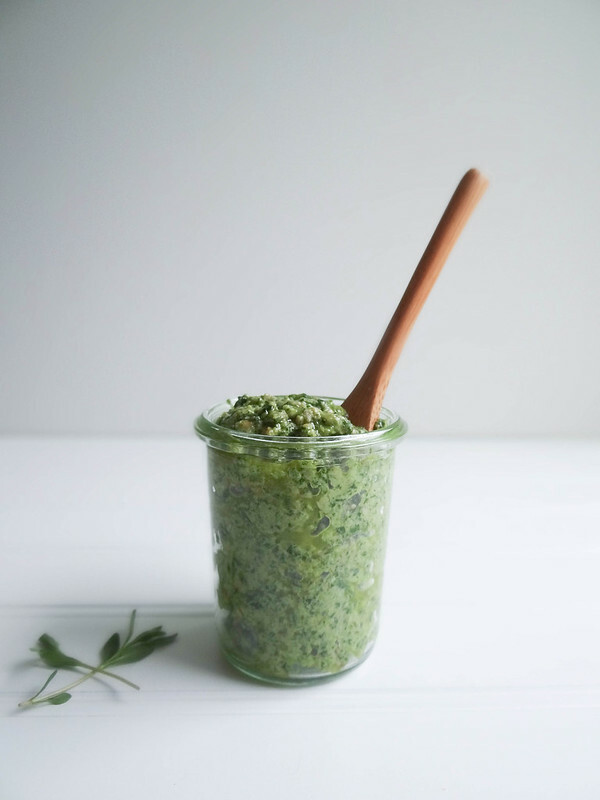 I used about 1/4 cup in a pasta salad, stirred a few teaspoons or so into veganise for a spread on my falafel burger, it makes an awesome base for your next pizza- super versatile & tasty, I never tire of this pesto. If you are a garlic wimp you may want to scale back to a smaller clove of garlic. I absolutely adore garlic so a large clove went in (about 2 small cloves worth). It's been a while since I posted an actual recipe. It feels so good to be back in this space , creating, testing and tasting. Taking a little break has brought me a bit more inspiration and my desire to create in the kitchen once more. 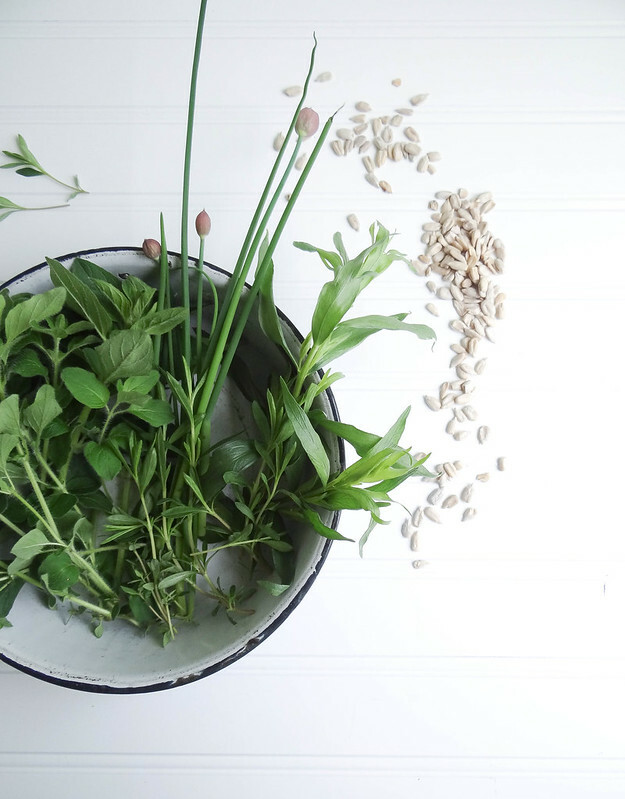 Sometimes creativity can go into hibernation, it's always there but once in a while it lays dormant- kinda like my herbs, once it comes back, it returns in full force. 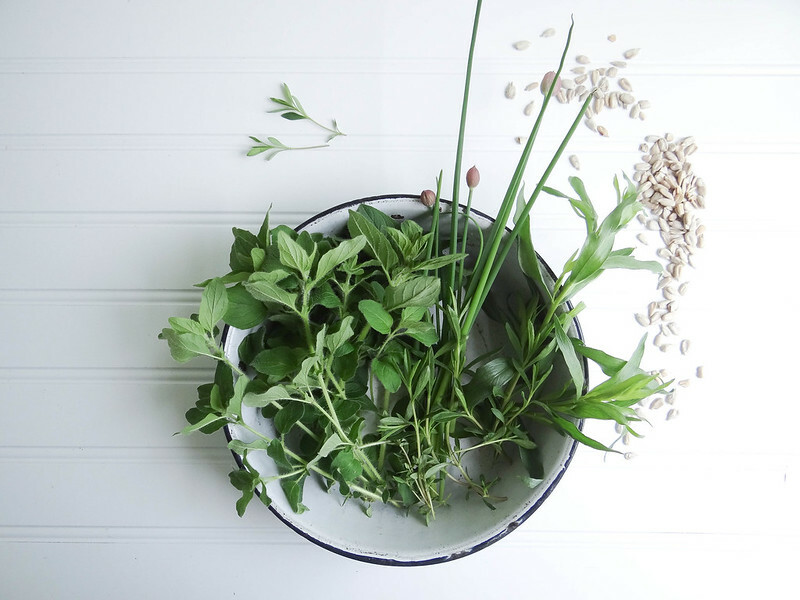 Place herbs through garlic in a food processor and pulse a few times until blended well. Slowly add the 1/3 cup of olive oil while food processor is running. 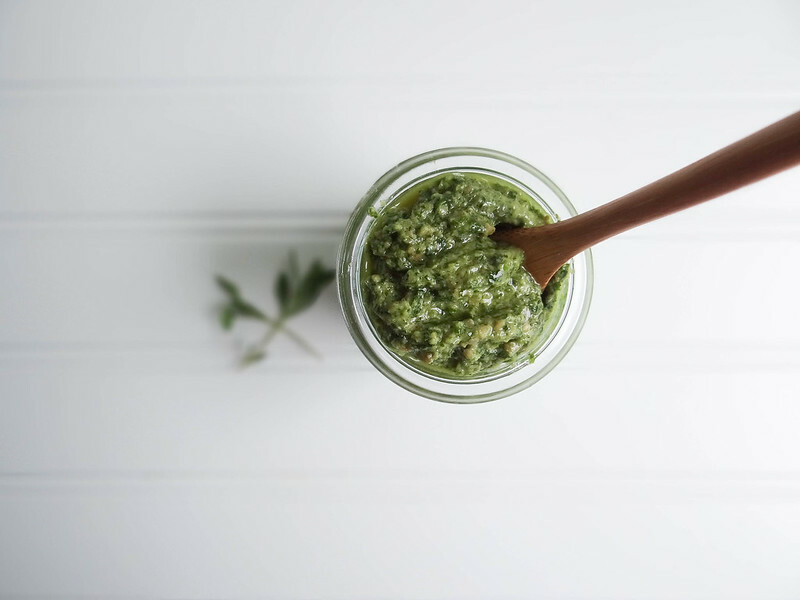 Blend until creamy and pesto comes together, add a pinch of salt and pulse a few times. Transfer to an airtight container, push pesto down to get rid of any air pockets (the air will turn the pesto brown). Prior to covering , add 1-2 tsp's of additional olive oil to cover the top of the pesto. I love trying different types of pesto combinations! This looks great! 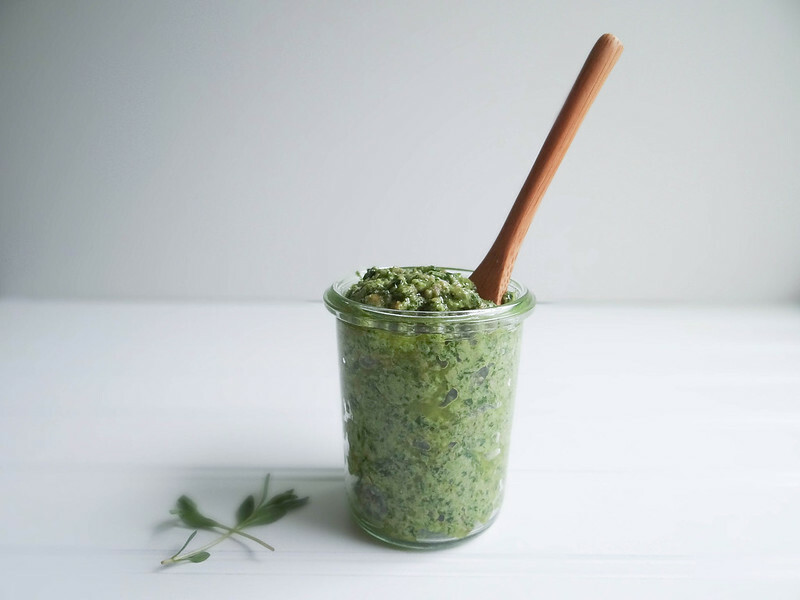 I made and herb pesto last week with basil, arugula, sage and parsley. I didn't think of adding sunflower seeds, but that's a good add! Thanks for sharing! The oregano has been growing like crazy this year! Looking great work dear, I really appreciated to you on this quality work. Nice post!